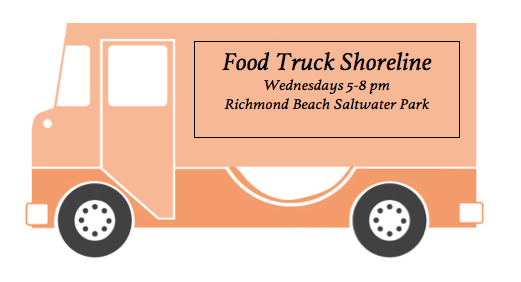 The wildly popular Food Truck Shoreline event will be back in Richmond Beach on Wednesdays, August 15 and 22, from 5:00 to 8:00pm. You can expect FOUR dinner trucks PLUS live music from some of the area’s top bands. The trucks will be located in the lower parking lot of Richmond Beach Saltwater Park. Enjoy your food and join the band at the upper shelter above the parking lot for a family-friendly beach party co-sponsored by Richmond Beach Community Association and the City of Shoreline.